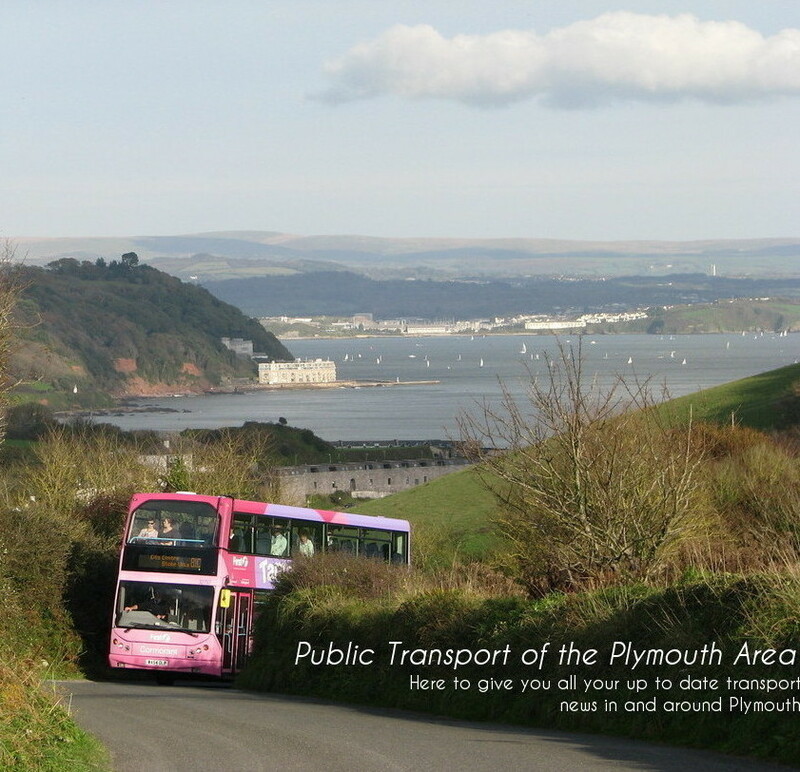 Earlier in the week I was pretty lucky in timing it perfectly to get this shot of all of Plymouth's major service operators in one shot! 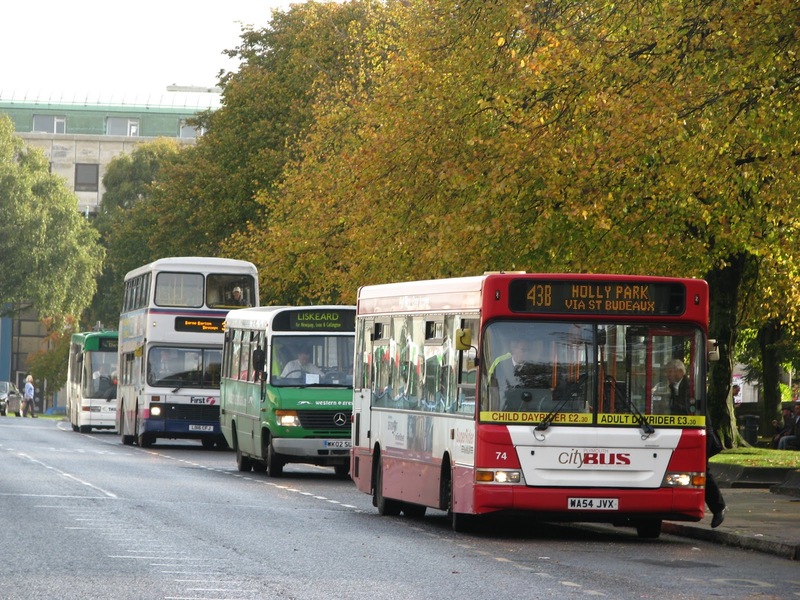 The four in the photo from bottom to top are Plymouth Citybus, Western Greyhound, First and Target Travel. Extremely rare to get such a perfect lineup on Royal Parade. Usually other services would be mixed in with it and would cause duplicates, or the less frequent services would be missing such as Western Greyhound's, and Target Travel, but it all just fell into place for this shot! Now the question is, which bus would you pick!? Snap on Sunday: Something old, something new..
Two photos for the Snap on Sunday this week, this being the first as some of you will have already seen the other which I posted on Facebook earlier in the week. 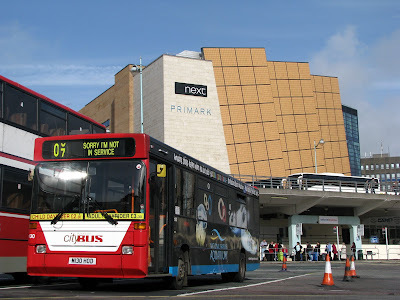 For this one I have plumped for this photo of Plymouth Citybus M130 HOD, one of the later Plymouth Citybus 'step' Darts, which will be leaving the fleet over the coming year. Naturally the M regs are expected to be the ones that last til the end, with the L regs being slowly withdrawn at the moment. Of course the exception is K107 SFJ which has been outliving several of the L reg batch, and still often sees daily service on the Shoppers Special services. Even L112 YOD or 'Dennis Dart' as 'he' is now referred to, should be withdrawn over Christmas. PCB announced on Facebook that Dennis Dart will be becoming low floor over the winter, so we shall see which he emerges as soon enough! But back to the photo, we had M130 down in Bretonside with the relatively new Drake's Circus Shopping Centre in the background. Strangely enough, even the shopping centre looks less of a box than the Dart! Tonight, for the last time, the 83, 84 and 86s will be rolling into Bretonside Bus Station, terminating here for the final time. The 83 is one of the best established Western National routes using Bretonside since its completion in 1958. But First, like with many of their routes, are now taking 83, 84 and 86 out of the bus station, and sticking them up on the already congested, Royal Parade. True that for passengers, this is likely a good move, but the top end of Royal Parade is already very busy. The Tavilinx services also include some extra layover time there, which could potentially cause problem. Or will we see buses simply returning to Bretonside for this layover period like Torpoint services now do on many occasions? 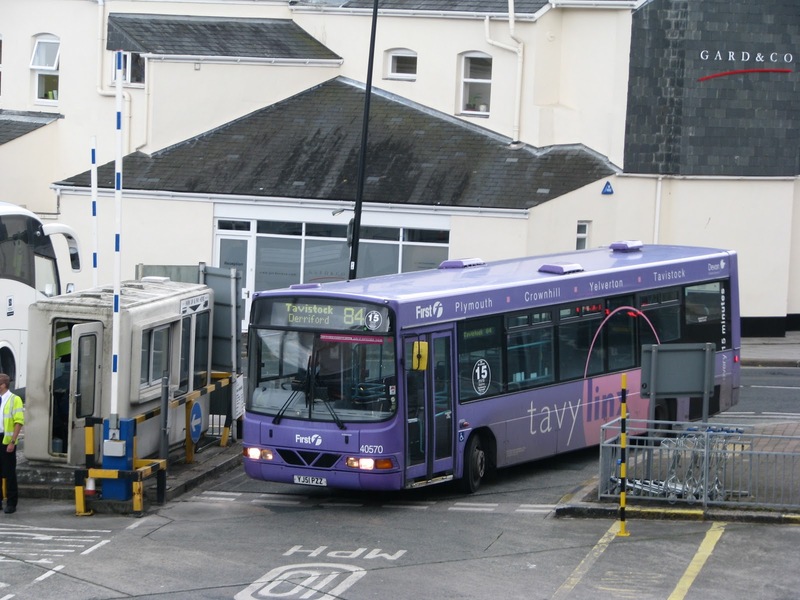 Torpoint services were taken out of Bretonside a while ago now, but many drivers do still park down in Bretonside rather than clogging up Royal Parade. But there we go, First has spoken. With this cut it brings the total daily bus services from Bretonside down 27% from 11, to 8. When new the bus station contained 25 services, so this is a 68% decrease. Many of the routes also had a higher frequency, so in total we have seen an even bigger reduction. Who can blame the bus companies though. Bretonside is by no means the nicest of places to be any more, and even though its right in the centre, Royal Parade is just that bit more convienient, especially seeing as Bretonside has no disabled access, meaning you have to walk round via the roads, rather than there being a lift in place. The photo above shows WJ51 PZZ coming into Bretonside on the penultimate day of operation. I have also included some more happy memories from the past with photos thanks to Louis Rawlings (the photo with Volvo Citybus 38015) and the rest are thanks to Derrick Cuff. A quick trip upto Exeter resulted in me finding some much improved looking Scania Enviro 400s bought a few months ago for use on the 57 to Exmouth and Brixington. The buses, I always felt look pretty bland, and even though these were top of the range new beats, nothing made them stand out amongst the midst of waves of Dennis Enviro 400s. 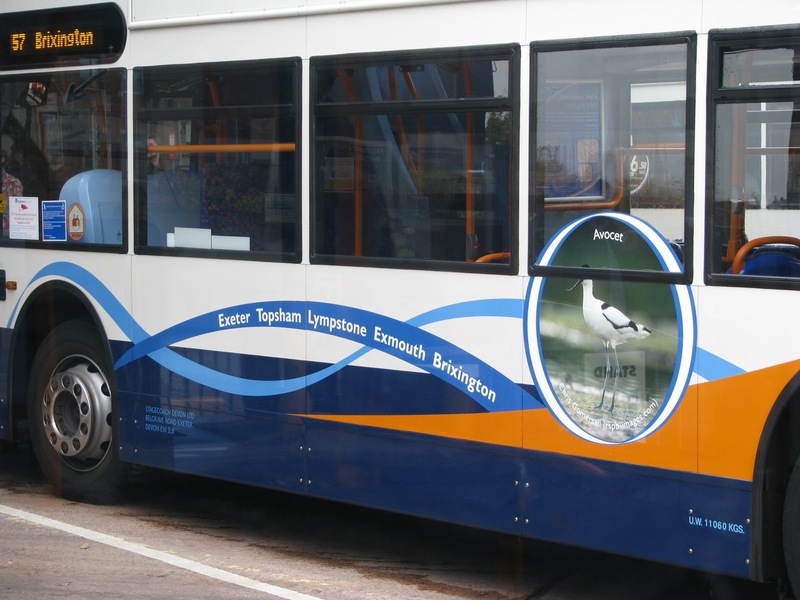 But branding has now been introduced in a similar fashion to the 'Go 2' branding applied to Enviros operating between Exeter and Newton Abbott a couple of years ago. I must say these really do look the part now, a really nice simple route branding measure always looks so much more tidy on vehicles I feel, than an all over advert, especially when they end up overlapping windows. The buses are now named after different wildlife you may be able to find along the Exe estuary, a nice touch! So here we have it in glorious technicolour (thanks to Tom Pearce), the new Plymouth Citybus logo. Sure at first glance it looks quite smart, but look closely. As has been afore mentioned, the image Go-Ahead are creating is very much like that of Go-Ahead's Oxford operations and indeed the logo carries this on, being pretty similar to Oxford's. This isn't necessarily a bad thing, but Go-Ahead promised to keep PCB's personal identity, and so far this seems to be slipping away somewhat. But anyway to the actual logo, personally I don't really like it. Its far too fussy. Its a bit of a mess with different word sizes, different colours, different fonts, different angles! They need a lesson on KISSing in my opinion! (Keep It Simple Stupid!). For a comparison I've included the old logo beneath as applied to the buses and the side of the building, showing the previous 2 logos. The one on the Dart, though somewhat bland, is nice and clean and tidy, nearly perfect! As a footnote, on my trip upto the depot, Andrew Wickham (the new PCB Managing Director) boarding the service to also travel upto the depot. But this was no 43 or 16! It was First Devon and Cornwall's 1A! Where is the company loyalty in that, may I ask! There wouldn't have been a massive wait to catch a but from Western Approach to the depot. But dare I say it, this is the foundations First was built on from day 1. "I'll just catch the 'First' bus!" So in classic Torpoint style she floated back and forth across the Tamar with some interesting photo opportunities available with her pictured with a Trident going the opposite way! The stranded passengers were lucky enough to get K803 ORL as a replacement to continue their journey on the 81C. Good news from one of the staff today though. He said to me that he had reason to believe that the K-ORLs have quite a secure 2 year future at Torpoint. Though K802 has now been withdrawn this is believed to be simply a bus to nick some spare parts from. Of course really this is quite traditional in that the most tired of a batch will be withdrawn early to keep the rest going! As a footnote does anyone know who has secured K801 ORL for preservation? Buses (is the grammar really correct there?) right the way up in the Highlands. 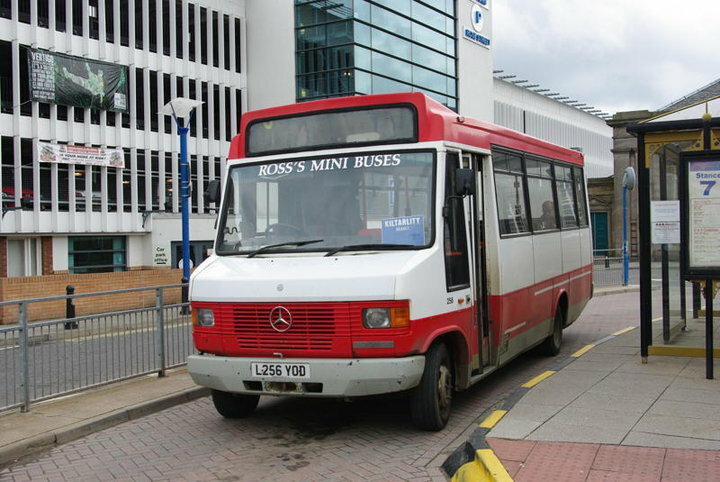 L256 is seen here in Inverness' bus station. It is not clear what route she was on with no route number or destination displayed, though the company generally operate niche routes operating once or twice a week from different out lying villages in the highlands. Great to see her still in good use though operating somewhere much different to what she would have been used for when working for Plymouth Citybus. 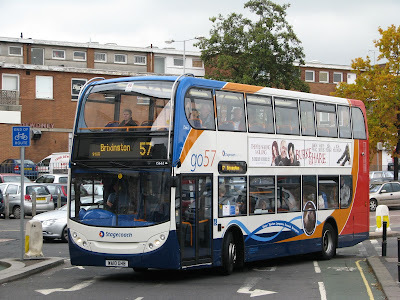 Please do visit Steve's fotopic for a large variety of bus and train photos from across the UK, its well worth a visit, just click the link below! Sad news to report on tonight is that long serving L113 YOD has had an unfortunate end to her life. With many thanks again to Tom Pearce I can bring you these exclusive photos of her in tatters in Milehouse depot. As the photos below clearly show she has been completely cannibalised. All but a few of the panels have been removed, all the interior has been completely stripped. The main mechanics are still in place though, but will also soon be stripped. L114 YOD has also been cannibalised with very little remaining. A real shame to finally see these old girls going. The L reg batch are in fact just a few months older than me. I just wish I'd appreciated them more. Much like the K-ORLs its been a case of you don't realise what you've got, until they're going. The rest should be around until Christmas where all step Darts are 'due' to be withdrawn. So still time to snap up the last few photos before they're gone! The above photos shows her in happier times back in 2007 on a 47A, taken using my old Vivitar! Leyland Atlantean WJY 578 took a trip down memory lane quite literally last weekend. This was the Atlantean's first trip upto Jennycliff since she was withdrawn. 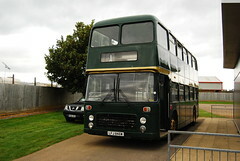 Of course the bus was specially liveried for the open top service back in the day, and owner Paul Furse hopes to put her back in the livery in years to come. Him and several others, including Tom Pearce who has kindly supplied the photo, will have been the first people to go upto Jennycliff on the bus since the withdrawal of FDC's old, old 17 a couple of years ago. Good luck to Paul with the further preservation of this fine looking bus! 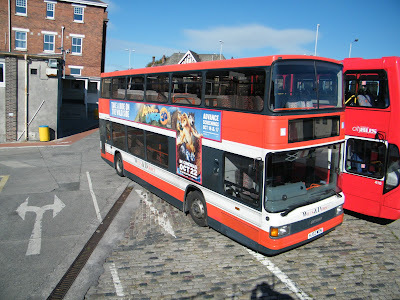 With thanks to Tom Pearce I can bring you the news (and photo) of Wilts and Dorset Optare Spectra HJ02 WDN, which has been at Plymouth Citybus for a refit. 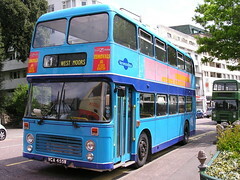 The bus travelled down from her home in Poole. She has come down for a retrim of the seats and possibly a repaint, seeing as she is still in the old Wilts and Dorset livery. I must admit though I do by far prefer this livery than the newer version they've come up with . This livery really sits well on the Spectra, as did it with nearly all of the types they run. I must admit I wouldn't mind a few of these in Plymouth! Even with the slightly dated styling these are actually newer than most of the PCB double deck fleet, including some of the new Volvo B7 deckers! Snap on Sunday: Something scenic! 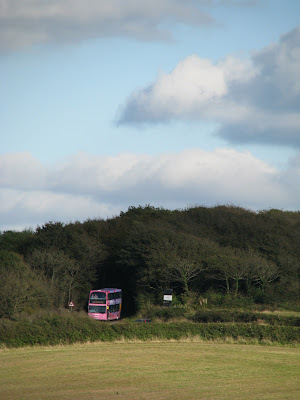 Yesterday I went for some very much local bus spotting on foot. With too much A-Level work to be done there wasn't time for a proper day out, but I couldn't go a Saturday without taking a few photos! So I had a walk round up to Whitsands before cutting across farmland towards Fourlanesend along footpaths to get some more interesting shots. The problem is I can't decide which one's my favourite! All have their own individual merits, so I shall post my top 3. 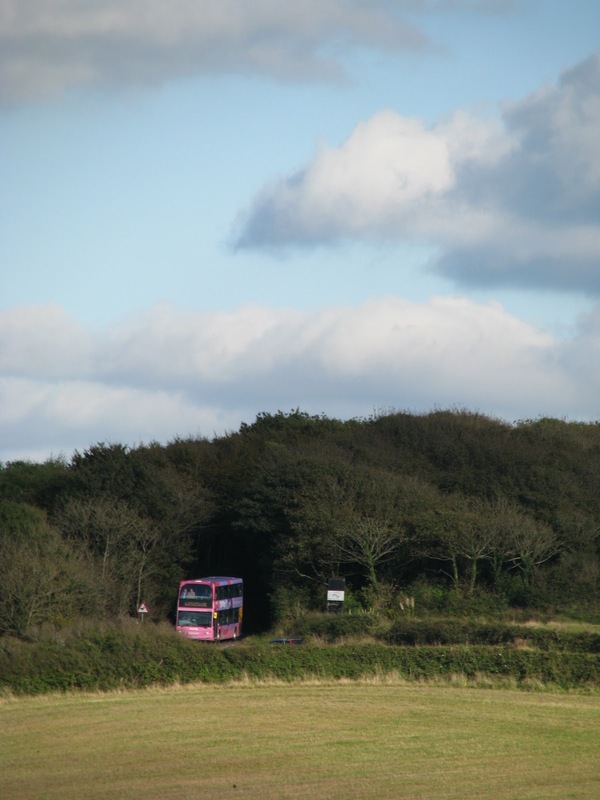 Firstly we have Trident, WA54 OLR seen here at Treehill, a complex of turns just after Whitsand Bay coming down the hill towards Cawsand. 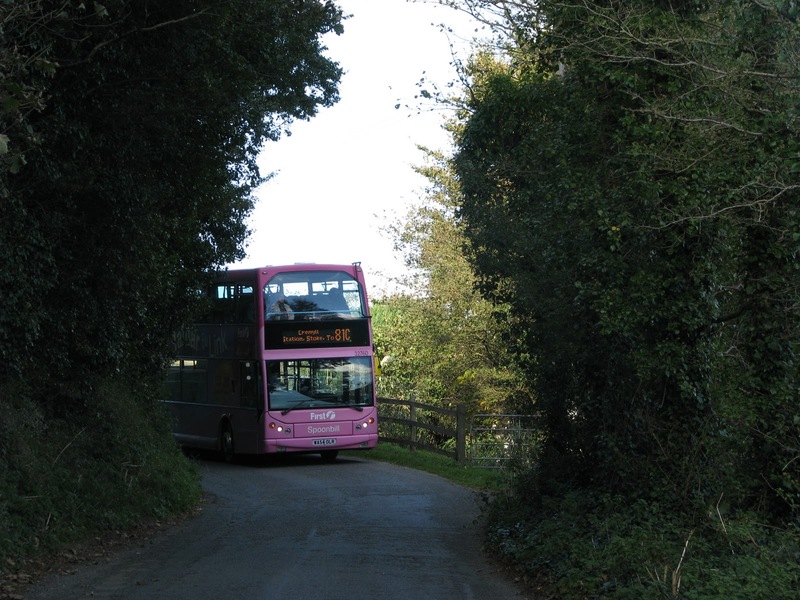 Next we have WA54 OLR again seen coming out of the trees at Maker on its way down towards Fourlanesend from Cremyll. If that hedge was just slightly shorter I would have been really happy with this one, but it does obsturct a small corner of the Trident. 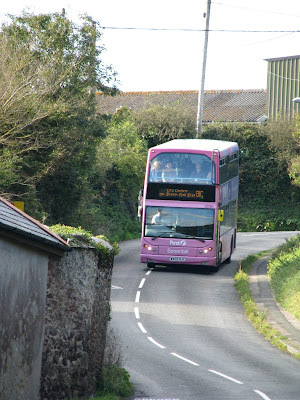 Lastly we have WA54 OLR again seen here coming down the hill towards Cawsand from Fourlanesend. The picture is a bit jumbled but I do like the addition of the stone wall. The metal farm buildings behind and telegraph pole spoil this one for me though! Western National Bristol RE, POD 829H came up for sale not that long ago on Rob Sly's excellent Bristol Enthusiast website. The bus was indeed sold on but has now re-appeared for sale on 'Ebay'. From what can be seen the vehicle does look fairly in tact. The bus still retains a livery given to it when working for Tally Ho! in the 80s, in a livery similar to what VDV 141S carries today. It has so far received no bids on Ebay though. The seller does not mension why its being sold on again, possibly because of the amount of work involved, though all that is listed 'wrong' is a rotten floor. Please click the link above to read on and see a photo! Thanks for the tip off from Tom Pearce! Another little interesting story has come to my attention with thanks to Dave Bristol VR news site www.ndl642m.blogspot.com. The VR in question is VCA 455W, a long standing stalwart of the V1 from Verwood to Poole. The VR was used on the Fridays only service as well as being used for a local school contract right up until this week, where finally, VCA had had enough. Thursday saw the announcement that finally after all these years of loyal service, VCA had suffered a mechanical failure, and therefore has been retired. The photo is supplied from a flickr user with credit to 'KK70088'. The vehicle that stepped in was even older than her though. AEC Routemaster KGJ603D, a modified long wheel base example has been drafted in, 'complete with conductor' to run the services before another vehicle can be sourced. Quite a treat for anyone in the area. She is seen here in Seldown Coach Park, in Poole with thanks to Luke Farley. It is such a shame to see the passing of yet another fine VR. This really seems to be it, with so few VRs still remaining in service. Of course even the youngest VRs are now celebrating 30 years on the road and this has traditionally been the cut off point. The only real numbers are represented in terms of open topped vehicles dotted around, but of course many of these aren't operational every day all year round. The only others are relegated to schools. At least in the south west, the only VR that does see daily operation all year round would be Roselyn's VR as well as Riverlink of course still owning 4 VRs, a couple of which are used on school services. Plymouth Citybus have now published their promised new website, and indeed as has been hoped, it does look much more professional and very smart. As can be clearly seen the new PCB branding is very similar to that of the Oxford Bus Company's. As a comparison I've added a photo of their website below. The information is largely the same but it is in a much more clear format than before. Unfortunately the timetables are still displayed in a pdf file rather than having it internet based, which can cause problems at times. A feature of the website is you can now 'sign up' to PCB and receive updates automatically sent to your e-mail address. I believe in time you were therefore also be able to login to buy tickets online? It all does look very promising. But this promised unique identity does seem to be somewhat slipping away! What a fantastic sight! 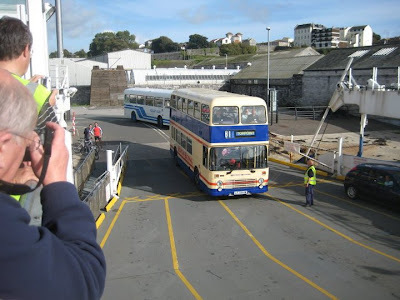 LFJ 844W rides the Torpoint Ferry once again after 4 years away from the water. A big thanks to Western Greyhound MD Mark Howarth for letting me use these wonderful photos of not only 844 but Tally Ho! LH, KJD 413P as well. This would have likely been her first trip across the Tamar on the ferry. But back to the main topic, I'm sure 1200 would have turned plenty of heads on the journey. An FDC Dart also joined the duo on the crossing so if I can find out who was driving, I'll ask his opinion on it! 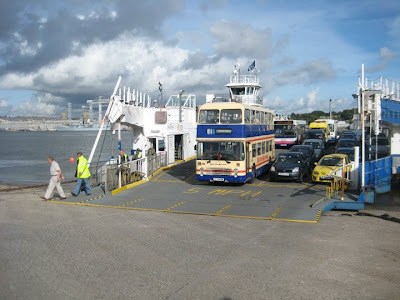 Who knows it may be someone who remembers driving 1200 back in her days at Torpoint. 1200 also had time to stop off for a visit to her old depot on Trevol Road. Unfortunately a good photo couldn't be taken due to positioning, but I'm sure it was quite a sight seeing her back among the Tridents that saw her withdrawal. As the picture nicely shows 844 boarded the ferry with ease without the use of a ferrylift fitted to today's buses. With the body modifications and modified springs the VR boarded the ferry with ease. Its not uncommon for Tridents to scrape the ground even with the ferry lift activated, but this just shows the versatility of the VR. I do hope I'll be able to witness a similar offering sometime in the future, LFJ 847W has been promised a trip across the ferry in the coming years so we'll watch out for that one. Restoration of 847 is still ongoing, but what a sight it would be to see the sisters paired up on the ferry again. Today I can bring you this fantastic photo with thanks to young enthusiast Kameron Allan. 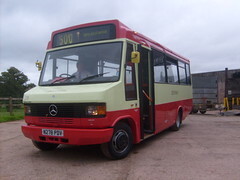 He's been out sampling the delights of the newly re-painted Ex-Plymouth Citybus Mercedes 709 N278 PDV. The bus looks extremely smart with the red and cream livery applied, much in the same way as the PCB livery was previously. 'Devonian' is applied to the side in Gold with fleet number 278 on the front. Its great to see another survivor from the batch after N289 has bought by Riverlink. Will be interesting to see the pair still working alongside each other into the 2010s! As a footnote please do visit Kameron's flickr site for more photos of the area by clicking on the photo! This classic London Routemaster is being used a promotional tool for 'Crabbie's' when seen today in Plymouth City Centre. 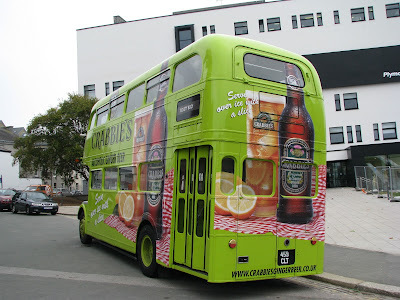 It seemed to be quite obviously aimed at the University with the bus parked next to one of the nearest pubs from the Campus. 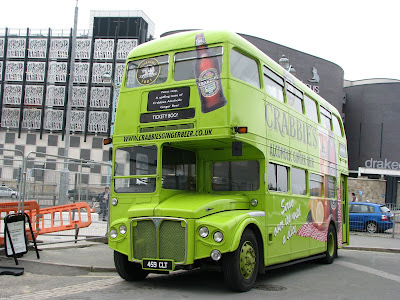 The Routemaster in question was 459 CLT which was in fact preserved at one point before being bought by Crabbies and converted for this use with a full kitchen/bar area on the lower deck. The bus was immaculately turned out and was a credit to its use. When going down Royal Parade I don't think anyone will have missed it! Unfortunately my attempt at a photo on RP was ruined by a Dart, how typical! Sad news to confirm today after K802 ORL has been confirmed withdrawn and awaiting disposal. 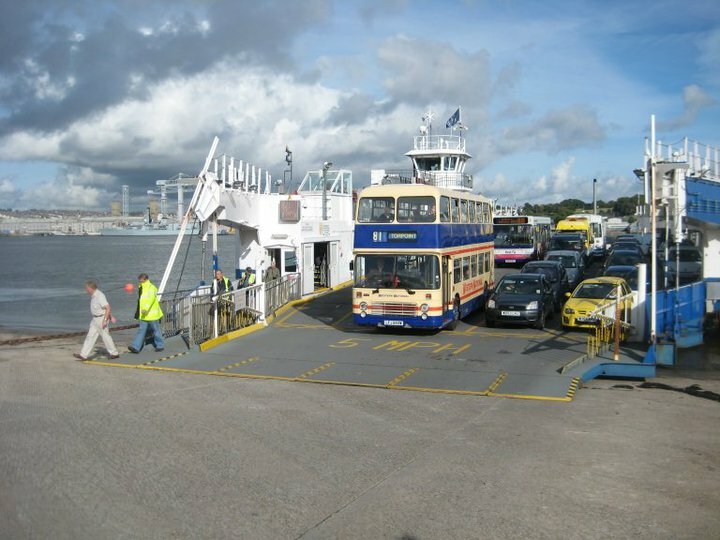 K802 was Torpoint's very first Olympian which joined the fleet way back while Bristol VRs were still in operation in Torpoint in 2005. K802 was brought in even before the C-HJN Leyland Olympians and has stayed with the depot throughout the 5 years, with the odd spell in Plymouth and other surrounding depots. But of course K802 was initially bought to run the X80 and indeed the bus was ideally suited for the job. In fact K804 ORL was spotted by myself operating the route just last week in which I will post the photo in the coming days. K802 is the only one of the batch that still retains her original Western National seat moquette where the other 3 have had the First Group moquette fitted. Indeed in this photo alone a lot of history lies. She is seen here in Antony operating the old 81A to Polperro. 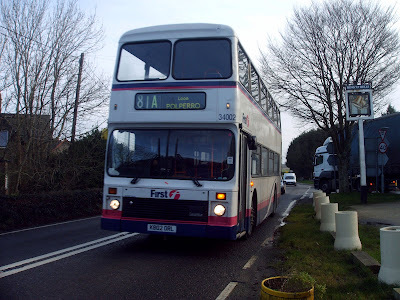 This is now of course the Sundays only 81B with slight route variations on the old 81A. 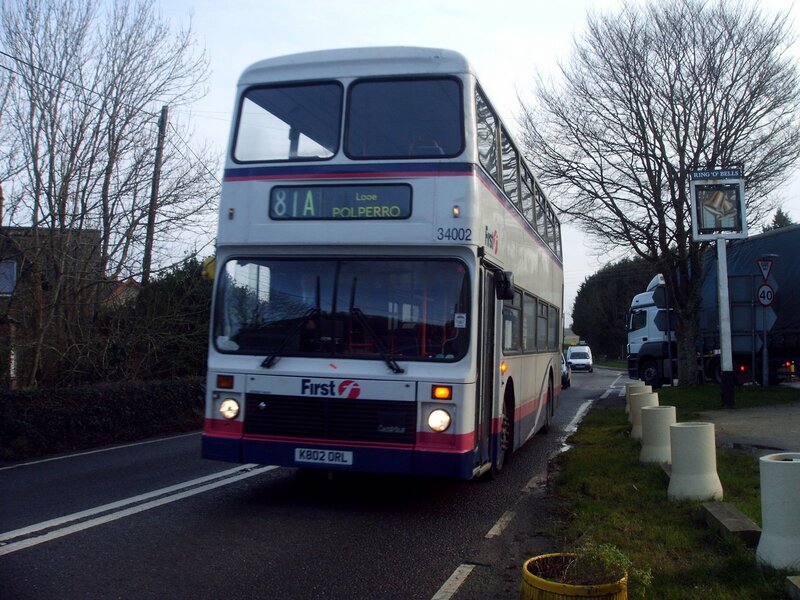 The driver on this trip I took was James, who was a trainee at the time, but can still be seen driving the 81 today. His trainer for the day was Alan Painter who has now moved into another job after being depot manager for some years. K802 still retains her roller blind in this photo which was later swapped for an electronic blind. The light surrounds have changed with the black surrounds not yet attached in this photo. K802 was included in the blog's very first month of operation with this photo included. The list carries on. I was so disappointed the first day K802 ORL came round the corner on my 07:42 81B trip to Cremyll in place of my beloved VR. In my fledgling years as a bus spotter K802 has guided my way, a real part of my generation being lost. K802 is just a few months older than myself and just thinking of all the happy punters that have ridden on her over my lifetime is really quite heart warming. Looe Valley Explorer Class 37 Thrash! Here is some footage of Class 37, 37685 thrashing along the river bank towards Liskeard on the trip myself and Louis Rawlings undertook last weekend. Be sure to turn your speakers up!! 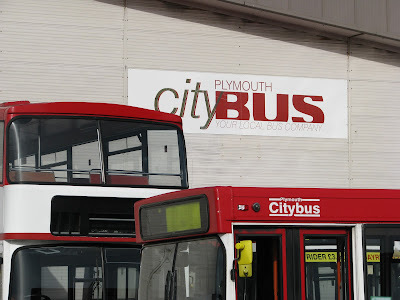 Plymouth Citybus are now receiving a further batch of Dennis Darts, this time with the more conventional Plaxton bodywork rather than the Wrights that were brought in before. 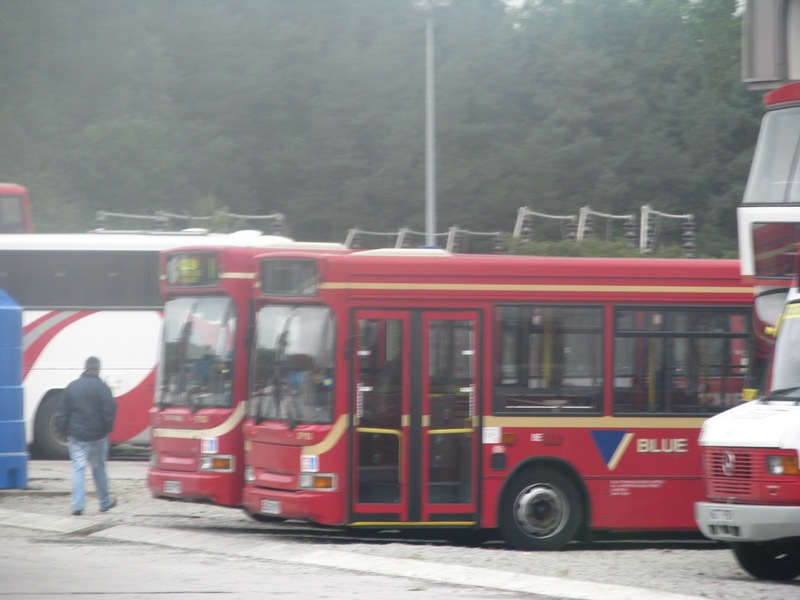 Here we see two of the new arrivals from 'Blue Triangle', a London subsidiary of Go Ahead. One of these two was EU53PYO, referred to as DP203. Again these are likely to see off more of the L and M reg step entrance Darts. Indeed it is increasingly rare to see them out and about in service now. Surprisingly though the 709s if anything seem to be making a bit of a comeback. I've certainly been seeing a few more than usual out in service. Is this a reminder of how temperamental the Solo can be, or do the drivers just prefer them! 1980 Bristol VR at Silverstone. Originally uploaded by Ackers- Schoolboy Hero!!!! That's right! Here is 1202 (38846), alive and kicking! Indeed she does still survive at the British home of motor racing at Silverstone. The photo caption reliably informs us she is situated at Bridge Corner behind a toilet block! Not the most glamorous of places, but its really great to see she is still in one piece after 4 years without sightings or photos since she left the depot in 2006. From the photo she does look remarkably intact with the fog lights still fitted and the seats still look to all be in place from what can be seen. The only part that seems to have suffered is the grill which seems strangely worn, but the rest of the paintwork looks extremely good in this British Racing Green! Please do click on the photo to see her in her full glory!